I recently enjoyed a trip around the Balkans with my newly-minted husband, accompanied by our guide and driver, Saimir. We hired Saimir through a travel agency, however, it turned out he was not really a guide or a driver—he was an Albanian construction worker—and he didn’t speak any of the local languages of the countries we visited, nor did he know his way from town to town in the region. This made his role as guide and driver a bit comical, but we appreciated his company nonetheless. By my description though, we were nearly sprinting up several miles of mountainous terrain, along a trail that far-too-casually laced along the edge of a 2400-foot cliff. We barely escaped a vicious attack from two very large, very over-protective sheep dogs whose herd we surprised with our presence, and lost our way multiple times between the rain, mud, and overgrown trail. And because we didn’t know what kind of journey we were embarking upon, we had only brought the 12 ounces of water and two bread rolls that happened to already be in our backpack. But oh, the scenery! It was incredible. 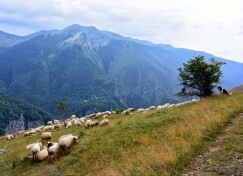 The Dinaric Alps were every shade of blue and green, stretching far into the distance with jagged valleys plunging between the peaks, and the village of Lukomir, population 25, was a National Geographic feature story waiting to be discovered. The fact that this adventure ended up being one of our favorite activities of the trip concerned me, though, because had we known the hard data before we started—seven hours, ten miles, dangerous conditions on an unfamiliar trail, and poor clothing and supply choices—I likely would’ve urged us to consider other options. It wasn’t that I wouldn’t have wanted to do something challenging; I would’ve just felt too unprepared or that the risk was too big, so I would’ve passed on an amazing opportunity. We, as individuals, a state, and a country—rightly—seek out a lot of information before we make big decisions. We do analyses of the financial cost, the potential unintended consequences, the risks to general stability, and public opinion polls. Will it be too complicated? Too costly? Too controversial? But because of this, no action often wins out over action that involves any kind of risk, because the potential for positive change feels uncertain while the potential for negative change feels all too assured. And so, we pass on opportunity after opportunity to try something new. We mostly all agree that our health system needs significant changes, but without incontrovertible proof that a certain piece of legislation or new initiative will be successful, we are more likely to allow the potential challenges to scare us away. Instead, we should be using the wealth of information available to us as an opportunity to be better prepared for our journey. The key though, is that we still go. It takes courage to act, especially in the face of unknown obstacles, but well-informed risk taking often leads to great success. I will look back on our adventures for years to come and feel both proud that I didn’t turn around and fortunate to have had the experience. I hope that over the next decade, we all will be able to look back on the transformation of our health care system with a similar mix of emotions. Now c’mon, let’s go change the health care system. It’ll be “easy.” I promise!